Washington, DC. 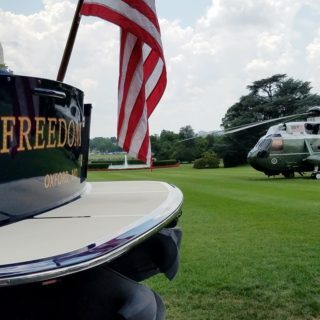 Hinckley Yachts will make an appearance on the lawn of the White House on Monday July 17th representing products made in Maine. The boat will arrive by trailer and be on display for a few hours before being returned to its Chesapeake homeport. In Maine, The Hinckley Company employs over 350 people in its boat building facility in Trenton, and in its two boatyards in Southwest and Northeast Harbors. The company builds about 50 boats a year in Maine. In addition, Hinckley operates another five boatyards along the east coast of the U.S. and an operation in Portsmouth, RI where it builds its line of Hunt Yachts. In total, the company employs 695 people in the U.S.
Hinckley builds both power and sailboats by hand, to order, for individual clients and the company counts many of America’s most well-known families among its boat owners. In recent years, the company’s building efforts have been primarily focused on powerboats of which the Picnic Boat is its most popular. 1,050 Hinckley powerboats have been built by the company since it launched its first waterjet propelled motorboat in 1994. Hinckley jetboats come in 29, 34, 37, 38, 43, 48 and 55-foot models and utilize waterjet propulsion systems to power them through the water. While innovation has much changed the boats over time, the low profile, classic sheer, the sweep of the coaming and tumblehome give the yachts a timeless appeal that is unmistakably Hinckley. The boat’s roots are in lobster boats that required topsides be low in order to haul traps in over the side. The company launched the Bermuda 50 sailboat in 2015 and builds a Daysailor 42 and the Morris line of sailboats. The company is vertically integrated offering clients boatbuilding, training, concierge and repair service and brokerage. The Hinckley Company was founded in Maine in 1928 and has been in continuous operation ever since including a period during World War II when the company built boats for the military. Hinckley is owned by Scout Partners, a partnership of former Secretary of Commerce Pete Peterson and David Howe. Peter O’Connell was appointed CEO and president in 2016. 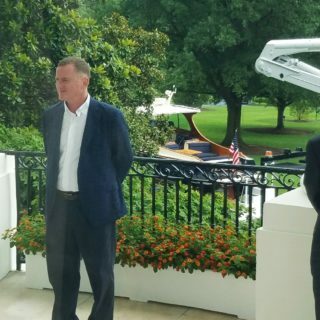 Present at the event at the White House are O’Connell and Regional Sales Director Jack Erbes. Erbes is a Maine native and started out as an electrician with the company 20 years ago. 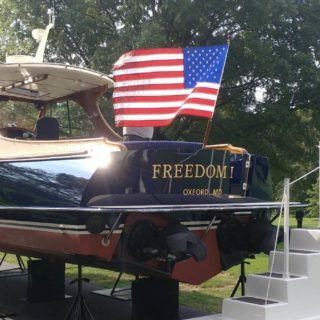 The boat on display is a Hinckley Picnic Boat 34, aptly named Freedom III, and is owned by Jack and Susan Stoltz of St. Michaels, MD. The boat carries an Annapolis hailport. Hinckley has reached what many call icon status: the familiar line and the handcrafted detail are the signature of the Maine boatbuilder which has plied its trade since 1928. Its founder, Henry Hinckley, set the company’s course firmly in the 1950s when he launched the Bermuda 40, a “gentleman’s racer.” Built of then radically-new fiberglass, the combination of elegant form, material innovation and consummate attention to finishing detail has been Hinckley’s heading ever since. Today, Hinckley builds premium powerboats from 29 to 55 feet and sailboats 42 to 50 feet. It also operates boatyards from Maine to Florida and owns Hunt Yachts. Hinckley owners enjoy a unique ownership experience augmented by the service program, extensive training, and lifelong support. Visit www.HinckleyYachts.com. To learn more about the Picnic Boat 34, please click here or complete the form below.